I have special memories with all of my grandparents, but as we’re growing up, we often never stop to think about who they were before we knew them. What stories do they hold? What makes them who they are today? You also never think about losing them, until you do. I grew up far enough away from my grandparents that I didn’t get to see them all that often, but they and my parents made sure we still had a wonderful relationship. My mom’s parents lived in Alaska and my dad’s in southeast Missouri. We typically saw both sets at least once a year, but we sent each other mail and received phone calls regularly. My Alaska grandparents had two phones in the house, so they could each sit by one so we could have a conversation with both of them. I lost my Grandpa Elmer in 2007. My husband didn’t get to meet him. I always think how they would’ve gotten along so well. Both interested in science, facts, and exploration. Both leaders. But who he was before, I only know from stories my mom has told. I lost my Grandpa Allen and Grandma Mimi within a month of each other in 2014. We shared many great memories, but, who were they before I knew them? I’m still unsure. I’ve searched ancestry records and haven’t found much. I knew my grandma was raised by her grandparents. I knew she drove a red Chevy Beretta at one point (because I had a teal Beretta). They were both marvelous singers and diligent, loving church members. I wish I knew their lives before me. I have one remaining grandma, my Grandma Rose. She lives in Anchorage, Alaska, with her partner, Dave. Grandma is the epitome of a Fit Bottomed Girl. She’s active in her community, a wonderful wife, sister, mother, and grandmother, a world explorer, a baker, a seamstress, and she just stopped skiing last year at age 80, due to health concerns. She certainly lives life to the fullest — as we should all strive to do. 1. What was your favorite toy or activity as a child? Swinging and singing. 2. What was one of your favorite shows as a child? There were no shows. TV came into Alaska in the 1950s. I was already gone from home when my parents got a TV. I did not own one until perhaps 1957. In my late years of high school, my younger sister and I sometimes got to go with my dad to a Friday night movie. Maybe a western, but the one I was most impressed with was Clark Gable and the way he kissed. 4. What’s one of your favorite memories from childhood? Building pretend houses in the woods. 5. What did you want to be when you grew up? An acrobat. I used to swing upside down. I could stand on my head and I could put my back against a wall and let my hands go down behind me until they reached the floor. We did tumbling in grade school and I loved that. However, I gave all those ideas up. My first inkling that I would not be a star in that profession was when I walked on a thin flowerbed railing; I fell and broke my arm in two places. 6. What’s one of your favorite activities now? I love volunteering, reading, sewing, and visiting with family and friends. I really enjoyed, though it has taken me two years, converting my photos into Shutterfly books. I just finished the last one. I’m anxious to get back to my piano. 7. What’s the best place you’ve traveled? The best place is always home. The most exciting and interesting trips were Africa, Greece, Canadian Maritimes, Wales and England. I love the tropics, and the trips to Samoa, Fiji, Costa Rica, and Rarotonga were also great. Driving around in Europe has its own place, also very special. Living in Spain was also very interesting and then on to Rome, Austria at Christmas, and the new year in Germany. It’s hard to choose. 8. If you could have lived in a different place, where would it be? I don’t know. Even now there is no one place that really jumps out at me as a long-term place. But in not too long, life will make that decision for me and I may look back and say the best was Alaska. 9. If you could have lived in a different era, what would it be? I like now with all the conveniences and the excitement of constant. New inventions and discoveries. 10. Do you have any regrets? No not within my control. My biggest regret that I could not grow old with Elmer. He tried to live on to be with me. And when he couldn’t, he arranged for Dave to fill in. 11. What was your favorite job? I always liked my career in human resources. I would have gone on working, except Elmer was failing and I wanted to spend as much time as possible with him. 12. What’s one of your favorite memories of being a mom? Washing dishes in the kitchen with one of the girls drying and telling me about school, friends, etc. 14. What are you thankful for? I am thankful every day for my family and friends and to be on this earth. 15. Is there anything left on your bucket list? Oh my yes! So many things that haven’t even jumped into the bucket. 16. What’s your favorite technological invention that occurred in your lifetime? What perhaps affects me the most, is the computer. I worked for many years with only a typewriter, so you planned what you were going to write. You couldn’t move sentences or paragraphs around or have typos. 17. What was your hometown like (where you grew up)? A small two-street town. When we had an overnight at our church we would all line up and walk the two streets and sing songs such as, “This Little Light of Mine.” We had a one-room store, one-room post office, small hotel and a wood sidewalk on part of that street. We had a large log community hall where high school dances, town meetings, and Christmas pageants were held. 18. If you could travel into space, would you? No, I no longer do well getting juggled. 19. Do you have a favorite age/stage in life? No. I had a tough stage, but it, too, had much to be thankful for. 20. Are there any secrets to living a long, fulfilling life? Find the good in others, don’t take yourself or life too seriously. Enjoy each day. Always try to help others. 21. If there’s any piece of advice that you feel you need to share, what would it be? Use the gifts God gave you. 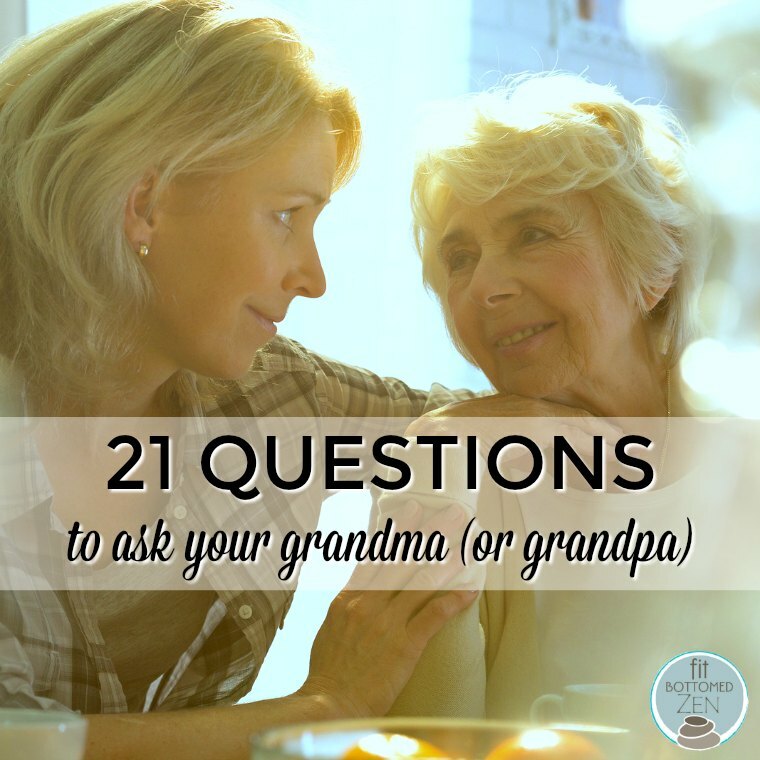 I learned something new about my grandma from every answer. Our time together is short, and no matter how much you think you know someone, there’s always more to their story.